Getting locked out of the house is something that can happen to anyone at any time. It’s a frustrating experience getting home from a long and hard day’s work only to realise that you do not have your keys.Fortunately, there is a solution: your friendly neighbourhood locksmith. Here is what you should do if you get locked out. You could have accidentally left one of the windows or back door open. If so, this can be an easy way of getting inside your house. It can turn out an embarrassing situation if you have called a locksmith and tell him you have managed to get in when he arrives. Therefore, it’s always a good idea that you make sure you have exhausted all the possible safe options you have to gain access to your house before contacting a locksmith to come and help you. – Does Anyone Have a Spare Key? It is highly possible that someone could be having a spare key to your house. 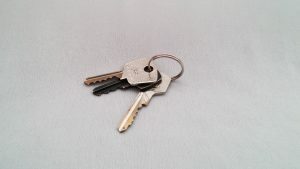 Have you ever given a key to your property (for instance, a friend, cleaner, babysitter, child or sibling) and they never returned it? If the answer is yes, call them and borrow their key to regain access to your home. Most people always carry their ID; however, if you are one of the few who doesn’t carry any form of ID, it is advisable that you make sure that you always carry some. There’s no reputable locksmith who will provide a service for someone who can’t prove their identity. Otherwise, anyone can call a locksmith to break into any house for them. Making sure that you always carry an ID can guarantee that this issue will never arise if you get locked out. You’ll have to pay for this service. If you can’t avoid calling a locksmith to come and help you out, you should ask for a quote to know how much it will cost before the locksmith arrives at your house. This will give you enough time to head to the close cash point and get the money so that payment can be completed after regaining access to your house. You should avoid dodgy locksmiths; cheap locksmiths aren’t always reliable. You should go for a quality service that’s reliable. Ensure that you opt for a licensed locksmith, who will definitely be more reliable. Also, you can find reviews on local locksmiths in your area. There’s even a possibility of a locksmith who is not licensed trying to overcharge you. Licensed locksmiths have pricing and guidelines they have to always abide by, that’s why you can trust them. For emergency locksmith services in Oxford and surrounding areas, feel free to contact CPPM Locksmiths. We offer emergency locksmith services 24 hours a day and 7 days a week. Our staff is highly skilled and CRB checked with your security in mind, so you will know who we are exactly when we arrive at your house. We are insurance approved and trustworthy. We conform to the latest British Standards and carry door and PVC window repairs.